"When I first met him, he never talked, just drew. He was catatonic, and the only voice he had was his pen. He was very productive. My mother thought he was retarded when she met him." R. Crumb has been making comics for well over 40 years now, but like many outside the world of underground comics, I didn't know much about him until I watched Terry Zwigoff's Crumb several years ago. Zwigoff's documentary presented a guy who by all appearances refused to play any games with how he presented himself to "proper" society; his general disdain for the materialistic, go-go nature of American culture is well documented in the film and in his art. What Crumb presumably didn't imagine is the success of the film, which enabled Zwigoff to make Hollywood features, and made Crumb himself the center of attentions he really didn't want. In retrospect, that Zwigoff's film did so well isn't a surprise; Crumb is an engaging figure to listen to, and his work, with its wicked humor and potent sexual content, is equally affecting. When you add to that Crumb's troubled family and disparate critical assessments, you have plenty of conflict to grab an audience. 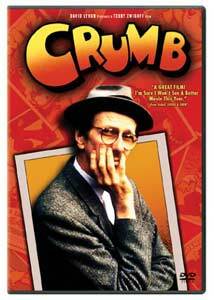 The film follows Crumb over an indeterminate period of time, as he and wife Aline and daughter Sophie prepare to leave the U.S. for France. Both Crumb and Aline have grown fed up with America, but Aline has taken the rather aggressive step of arranging to leave the country. The film serves as a tour of some of Crumb's old stomping grounds, with visits to former girlfriends and fellow artists in addition to Crumb's brothers and mother. Zwigoff presents critical arguments for and against Crumb's work, and we get to see Crumb wander the streets of San Francisco, sketching the passing mob. One of the appealing elements of Crumb is the absolute honesty Crumb brings to the proceedings; the various interviews I've read of Crumb show that he's not afraid to state his opinion, and that makes for a great subject. Crumb consequently holds forth on any number of topics, ranging from his unpleasant school experiences and family life to his well-documented sexual peccadilloes to what he thinks of American society. That honesty extends to Crumb's family, mainly seen in his brothers, Charles and Maxon. Charles presents a fascinating figure, a man Robert considers more talented than himself, yet hopelessly crippled by psychological problems. Maxon comes off as a bit more normal, but still fairly unusual. Zwigoff shows us plenty of Crumb's work, and allows critics on each side to speak their piece about it. Noted art critic Robert Hughes comes out strongly in favor of Crumb's work, while former Mother Jones editor Deirdre English and cartoonist Trina Robbins discuss the problems they see in his work, specifically in relation to women. Related to that, Zwigoff includes some of Crumb's former girlfriends and his first wife, all of whom are more or less positive about him. In the end, though Zwigoff is a friend of Crumb's he leaves the viewer to decide their own opinion of the artist and his work. Crumb's own statements and material provides plenty of ammunition for critics, and audiences seem to either love the film or hate it, based on what I've read and heard from others. Crumb's work is polarizing in that respect, and his intense contempt for most of modern society no doubt rubs some the wrong way, especially if they see themselves as the target. Crumb remains in France, where he continues to work, doing work for The New Yorker and other publications. Thanks to the film, he gained another level of popularity, something he was unsurprisingly rather ambivalent about. This disc, released to help hype Art School Confidential, Zwigoff's latest film, will hopefully help expose Crumb's work to more viewers. Image Transfer Review: Though the film is preceded by a "this film has been modified from its original version" disclaimer, the full-screen aspect ratio looks okay to me. The IMDb, admittedly not the most reliable source, gives the aspect ratio as 1.37:1, so the disc would be correct if true. Otherwise, the picture has a worn in look to it, by which I mean it looks like an older film than it is. Though there is occasional speckling and dirt, I didn't notice any major problems in the transfer. Extras Review: The prime addition to this new edition is a commentary with Zwigoff and critic Roger Ebert. Ebert was an early supporter of the film, championing it in his newspaper gig. The two provide listeners with a low-key commentary, although neither has apparently watched the film in a while, judging by the some of the comments they make. Still, Zwigoff relates some interesting anecdotes about its making, and Ebert plays something of a moderator, raising numerous questions about Crumb and the film for Zwigoff to cover. A brief clip from Zwigoff's upcoming Art School Confidential (02m:08s) is thrown in as well. An enthralling documentary about a legendary artist, Crumb presents a warts and all portrait of Crumb, his family and his work. Not for all tastes, given Crumb's general subject matter and brutal frankness regarding just about everything, but certainly worth watching for those looking for something more offbeat. The disc itself upgrades the previous edition by adding a commentary and a new transfer.